"The Supreme Court while transferring the Sohrabuddin trial outside of Gujarat had envisaged the starting point of the trial to be the assignment of the case to an appropriate CBI court by the Administrative Committee of the Bombay High Court...judge Utpat had required the personal presence of Amit Shah on June 26, 2014, and at 4 PM on June 25, he was transferred to Pune with immediate effect by the Administrative Committee! ...please call for the records of the Committee and initiate suo motu contempt proceedings against the Committee...also, the transfer should not be explained by the state of Maharashtra but by the High Court,”, argued Senior Advocate Indira Jaising. “It has been alleged that the entire system is dancing to the tune of one man. If that is true, we might as well wind up the judiciary", submitted Senior Advocate Harish Salve. As the hearing in the string of PILs seeking an independent probe into the death of CBI special judge Loya resumed on Friday, advocate Prashant Bhushan continued his submissions on behalf of the CPIL. He relied on an article dated February 11, 2018 published in The Caravan citing observations of renowned forensic expert Dr RK Sharma (formerly the head of Forensics Department at the AIIMS, New Delhi) that he had rendered upon examination of judge Loya’s medical reports. “Dr. Sharma has mentioned signs of possible trauma to the brain and even a possibility of poisoning...he has clearly stated that there is no evidence of a heart attack in the histopathology report...in fact, he has noted that the post mortem report reveals a calcification in vessels and consequently, judge Loya could not have suffered a heart attack...the postmortem report has also shown a coronary artery insufficiency which again rules out a heart attack...further, Dr. Sharma has opined that the congestion of the dura (the membrane surrounding the brain) and also in several other body parts such as the spleen, liver, kidney, oesophagus, lungs could be on account of poisoning,” he said. Thereupon, Bhushan reiterated renowned cardiologist Dr. Upendra Kaul’s response, on the latter’s examination of the ECG report published by The Indian Express on November 27, 2017, to a question posed by the advocate via email as to whether the ECG reveals any evidence of a recent acute myocardial infarction (heart attack). “Most unlikely”, Dr. Kaul had written. “The examination of the histopathology report has revealed narrowing of arteries and congestion in the brain, but the heart tissue and muscles have shown to be normal. When there is a heart attack, one part of the heart dies and that would have been apparent in the microscopic exam...,” continued Bhushan. “After Dr Sharma’s observation relating to the congestion in the brain as well as other body organs, I consulted several other doctors who opined that the congestion may also be imputed to an intensive CPR, but not a heart attack...they also said that even on account of a CPR, the congestion could not have reached the brain...besides, if CPR so intensive was administered, the patient’s ribs should have ordinarily been broken,” submitted Bhushan. Elaborating on the “abnormality” regarding the preparation of the viscera report, he advanced, “The viscera samples were sent on December 1, 2014, but the viscera exam started only on January 5, 2015, five weeks after the sample was received...despite the examination having been concluded on January 19, 2015, the viscera report was prepared only on February 5, 2015”. “The doctors at both Dande and Meditrina Hospitals have stated that ‘Tall T waves’ were apparent in the ECG report which are symbolic of a heart attack, yet the state of Maharashtra did not furnish the report before this court. It may be recalled that judge Rupesh Rathi had said in his handwritten letter that the ECG machine at Dande was broken and so no ECG could be carried out,” continued Bhushan. “Does this ECG report show ‘Tall T waves’,” inquired Justice DY Chandrachud. “None of us are medical experts...both Dr. Sharma and Dr. Kaul are only giving an opinion...based on article of February 11, the Nagpur police has addressed a letter to both AIIMS, New Delhi and the KEM Hospital in Maharashtra...Dr. Sharma has offered a clarification on his opinion...I did not want to get into this but now that the issue has been raised, I will show what Dr. Sharma has said regarding the publication in the Caravan”, intervened senior counsel Mukul Rohatgi. Chief Justice Dipak Misra also asked Rohatgi to file all relevant documents. Referring to the video recordings of the interviews conducted by journalist Niranjan Takle with judge Loya’s father and sisters, he advanced, “It is clear from those recordings that they are speaking from the heart...they were not tutored...that they have changed their stance during the course of the discreet inquiry is itself a cause for concern”. “Two of Your Lordships (Justice Chandrachud and Justice AM Khanwilkar) have been judges of the Bombay High Court and the judges who are witnesses in the present case may be your acquaintances. In these circumstances, would it be appropriate for this matter to be adjudicated by Your Lordships,” asked Bhushan. “Would you rather that the matter was heard at Bombay High Court,” inquired Justice Khanwilkar. It may be noted that the apex court has transferred to itself two PILs filed in the Bombay High Court, one by the Bombay Lawyers’ Association and another by one Suryakant Lodge , praying for an independent investigation. “Whether it would be appropriate for us to hear a matter, we ask ourselves in every case. If you have an objection, frame your argument clearly and we will answer,” said Justice Chandrachud. Responding that he has not moved any application for recusal, Bhushan concluded his submissions, citing the recent shocking episode of the Maharashtra Chief Minister’s cousin making a threatening phone call to an advocate gathering data on the mysterious death of judge Loya- “You watch out...we are coming back to power even in 2019...”, quoted Bhushan him as saying. Thereupon, senior counsel Pallav Shishodia, appearing for Bandhuraj Sambhaji Lone, the first petitioner, made a brief submission- “We disassociate ourselves from all allegations being levelled against the Bombay High Court judges as well as the district level judges...we are satisfied with the statement of judge Loya’s wife’s statement that the family has overcome the grief and that they have no suspicion”. As senior counsel Indira Jaising commenced her submissions, she sought to establish the locus standi. “Your locus is not being questioned”, remarked the Chief Justice. “It is in public interest”, added Justice Chandrachud. (‘I cannot deny what happened at the hospital. That is for the judges to deny’, began Mr. Rohatgi. “The transfer of judge Utpat has sought to be justified by saying that when the transfer had been effected, the trial had not commenced...it has been contended that the trial commences when the charges are framed... [in CBI v Amit Shah (2012) 10 SCC 545], the Supreme Court while transferring the Sohrabuddin trial outside of Gujarat had envisaged the starting point of the trial to be the assignment of the case to an appropriate CBI court by the Administrative Committee of the Bombay High Court...judge Utpat had required the personal presence of Amit Shah on June 26, 2014, and at 4 PM on June 25, he was transferred to Pune with immediate effect by the Administrative Committee! ...please call for the records of the Committee and initiate suo motu contempt proceedings against the Committee...also, the transfer should not be explained by the state of Maharashtra but by the High Court,” she continued. “Also, the postmortem report cannot be regarded as the evidence in law. The evidence would be the statement of the doctor who could use the report to substantiate his statement. The Commissioner of State Intelligence did not record the statement on oath of the doctor who carried out the postmortem,” she pointed out. Reiterating her earlier argument, she submitted, “neither enquiry under Section 174 of the CrPC was carried out nor a FIR was registered”. Advocate Jatin Sehgal, for Tehseen Poonawala, drew the attention of the bench to the difference between an ‘investigation’ under section 2(h) of the CrPC and an ‘inquiry’ in its section 2(g): “‘Investigation’ is the collection of evidence, while ‘inquiry’ is a judicial proceeding. What the state of Maharashtra has conducted is an ‘investigation’. But an ‘investigation’ cannot be commenced without a FIR under section 154, CrPC. So the report of the state intelligence does not meet the legal parameters”. “Since judge Loya had died in the custody of the four judicial officers, they are to be deemed as suspects. The statements of the independent witnesses have not been taken in the discreet inquiry”, he continued. “So you are saying that (the investigation) started with the suspects and ended with the suspects, and hence, there is suspicion,” remarked the Chief Justice. “For some individuals, the say has been recorded under Section 161 CrPC, while for others, the say has been ‘called’...Dr. Prashant Rathi’s statement recorded in 2017 prior to the commencement of the discreet inquiry mentions the four judicial officers for the first time, while the four district-level judges do not name Rathi even in their 2017 letters... Besides, the state Intelligence Commissioner had telephoned the judges personally before his letter (requesting for their statements) was delivered to them”, submitted Sehgal. Senior counsel PV Surendranath, making a reference to the Vishaka judgment, advanced, “In such cases, there is no intervenor or respondent. The state must facilitate the finding of the truth”. He repeated the prayer for Registration of a FIR and investigation. “The same applies to even carrying out a postmortem. But the postmortem was conducted. And my submission was for either a FIR or an enquiry under section 174 of the CrPC,” responded Jaising. Continuing, Rohatgi submitted, “When such an article appears, the state takes recourse to its vigilance manual and in accordance with the same, the discreet inquiry was directed to be carried out by the senior most official...the CBI manual also speaks of a similar inquiry”. “The manual talks of corruption-related offences by public servants. It does not apply to your case”, noted Justice Chandrachud. “It is similar to the IB reports (Intelligence Bureau)...they are not covered under the CrPC...it is in the nature of a discreet inquiry...,” responded Rohatgi. “After the Caravan article dated February 11 appeared, Nagpur Police addressed a letter to Dr RK Sharma, seeking a clarification thereon. Dr Sharma, in response, had said he has been misquoted in the article. Further, a letter was also written to Dr Harish Pathak, head of forensics at the KEM Hospital. In his reply dated March 5, Dr Pathak has stated that the ECG shows ‘Tall T waves’ which are symbolic of myocardial infarction”, he advanced. “Dr Pathak has relied on the statement of the doctor of the Meditrina Hospital and that of another doctor dated February 14. How did he get these statements,” asked Justice Chandrachud. “The Commissioner of State Intelligence had finished his job in November 2017. After the second article appeared on February 11, more statements were recorded by the Nagpur Police”, added Rohatgi. As to the contention that Dr Prashant Rathi’s statement was recorded on November 22, 2017, a day before even the state government had swung into action, Rohatgi submitted, “after the Caravan article appeared in November 2017, the said statement was recorded by PS Sadar. It was not recorded by the state Intelligence Commissioner. He had merely called for the records from Nagpur in the course of the discreet inquiry”. 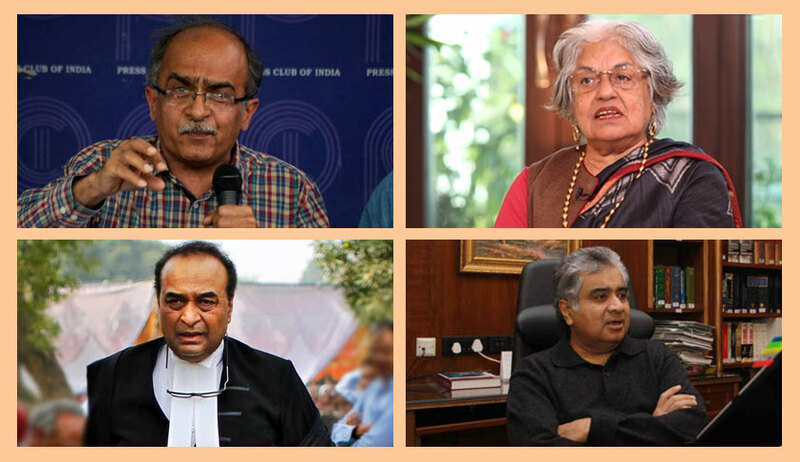 “Instead of questioning why the CBI did not file an appeal (against the discharge of Amit Shah), the petitioners could have preferred the appeal...that man (social activist Harsh Mander) had sought to appeal but it was dismissed by the apex court...now three years after judge Loya’s death, crocodile tears are being shed for the independence of the judiciary...”, remarked Rohatgi. Due to the paucity of time, Rohatgi could not complete his submissions on Friday. He shall continue on Monday. In the course of his submissions, Salve mentioned an incident of 1978 wherein Supreme Court Justice YV Chandrachud had reminded acclaimed jurist Nani Palkhivala that speeches are made not in the courtroom, but in the Parliament.